Our PB&A – (Peanut, Banana and Apple with Flax seed) biscuits are formulated with Canna-Pet® Advanced and baked in the USA with organic, non-GMO, quality food ingredients. We hold our biscuits to the same quality standards as the food you serve to your human family. Our bite-sized biscuits are perfect for any size pet, easy to feed and bring along when traveling. Each box contains 37-40 biscuits (8oz / 227g). 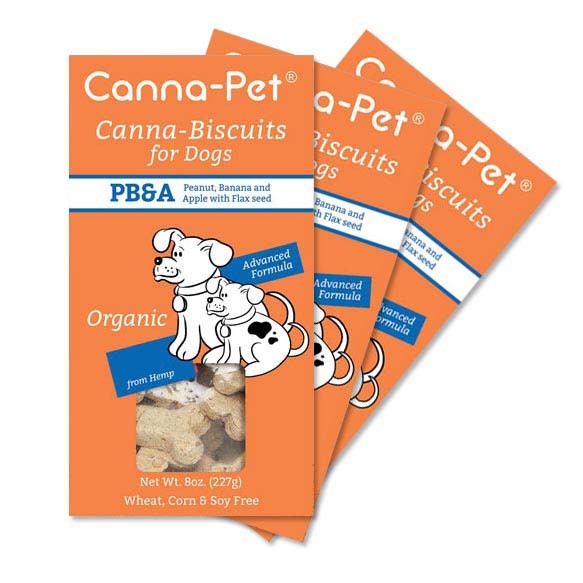 Each biscuit contains 80mg of Canna-Pet® Advanced Small formula.100% organic hemp. Vegan Biscuit 3-pack – 3 8oz. boxes of our PB&A (Peanut, Banana & Apple) flavor – for a discounted price! Each biscuit contains Canna-Pet® Advanced, a mix of CBD and terpenes. We employ proprietary processes to deliver as much of the hemp, terpenes and flavonoids as possible. This key feature ensures your pets benefit from a broad range of CBD phytochemicals. Canna-Pet® products are made exclusively from industrial hemp, a non-psychoactive plant which represents a natural hemp source for pet supplements. Dogs under 20lbs (9kg): 1 biscuit every 12 hours. Dogs 21-44lbs (9.5-20kg): 2 biscuits every 12 hours. Dogs 45-95lbs (20-43kg): 3 biscuits, every 12 hours. Dogs over 95lbs (43kg): 4 biscuits every 12 hours. Ingredients: Organic Barley Flour, Organic Peanut Flour,Organic Bananas, Organic Applesauce, Organic Peanuts, Organic Flax Seed, Hemp.